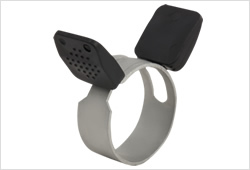 is shape makes it possible to keep roundness even when the hose clamp is opened. In fact there is another approach to obtain this effect that is ‘keeping roundness’. 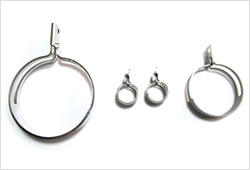 But our approach has the merit of designing more powerful hose clamp which can replace the worm band in some cases. Austempering of tool steel to HV520 realizes the highest balance of toughness and hardness comparing with the other material. Our standard surface treatment is Geomet coating. Besides this, we can provide various surface treatments according to the user’s purposes. Our products clear and keep the environmental regulations like Reach and RoHS. We can provide the latest data of AIS or IMDS responding your request. Crescent Clamps®can be applied to the hose O.D. from 7.5mm to 60mm and over. Bigger size than I.D 60mm can also be provided as a special order product. 様々な環境規制をクリアした協力メーカーによる表面処理に対応しております。We provide many kinds of surface treatments according to the uses and purposes. They all meet primary environmental regulations. Geomet Plus is top coating for Geomet coating. There are some options according to its uses and purposes. Its colors are clear, black, or the other. Trivalent Chromate is chemical conversion treatment on Zin plating. It features appearance, smoothness, and adhesiveness. We can provide the other kinds of surface treatments according to your uses. In case of clamping over φ60mm hoses a worm bands is commonly used because of its clamping force and stability. 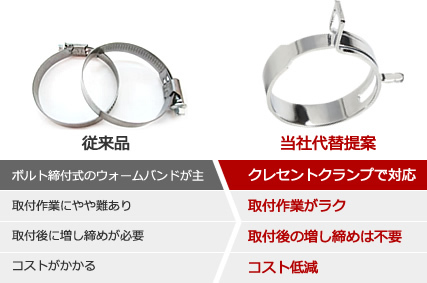 Crescent Clamp® has also the same functions and the other advantages. That is the usability and the cost. It is very easy to fit and no need to maintenance such as retightening.